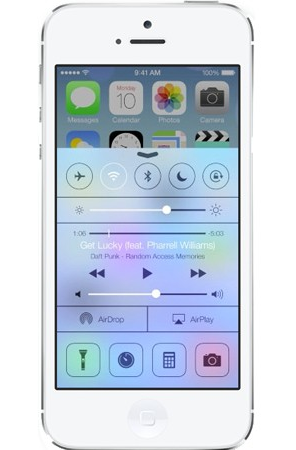 Control Center is a brand new feature in Apple’s new mobile operating system, iOS 7. Control Center is all about efficiency. It has all the features that are used on a day to day basis just a swipe away. The best thing about control center is its interface is very accessible. One swipe up from the bottom of the screen and Control Center’s simple yet effective layout is presented. Features from the settings app include: Airplane mode, wifi, bluetooth, do not disturb, lock orientation, as well as brightness. I find these to be quite useful. This is because I am frequently adjusting the brightness, turning on bluetooth, and using wifi. Prior, I would always have to open up the settings app to access these features but now I have them all in one convenient spot. Additional features include: airdrop, airplay, sound controls, music controls, and four buttons that activate the camera flash, the clock app, the calculator app, and the camera app. All in all, I am quite pleased with Apple’s inclusion of Control Center. It is quite simple and time conserving, yet intuitive at the same time.